Are “Speed Up Your Computer” Programs a Good Idea? You probably have been alerted by popup windows while surfing the web. These popups claim your computer has thousands of errors requiring urgent attention. The popups offer a “solution” to cure your computers so called problems. 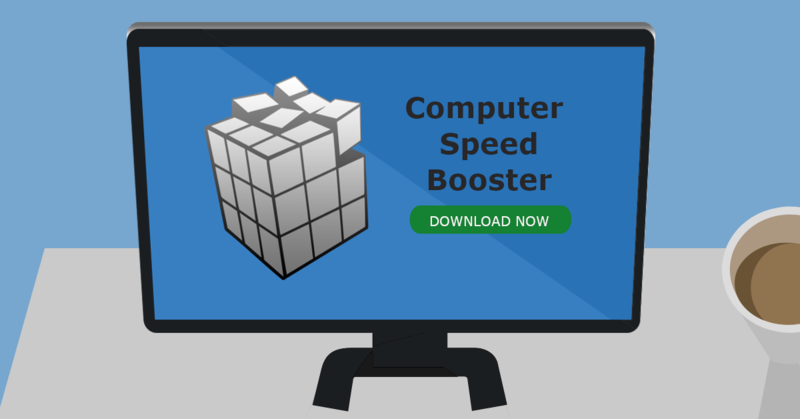 These advertisements are often described as Speed Booster or Speed Up utilities Reg and will attempt to convince the user they will somehow clean or improve their computer. Within the IT industry these programs are known as “scareware”. They are adverts and software programs specifically designed to convince you that your computer has problems – which it might not have. Are these popups and utilities trustworthy? Almost all popups and advertisements that use adverts saying “Fix now for free” or “Speed up your computer” are not trustworthy at all. They are little more than a scam attempting to take your money and / or install malware on your computer. At best these programs claim to scan your computer and show a list of plausible sounding computer problems. Using this, they will ask for payment to “fix” these problems and “speed up” your PC. Some may even attempt to use these fake warnings and scare tactics to trick you into installing malware on your computers. Once installed, the malware can go many things including stealing files, accounting information, usernames, passwords, emails, and credit card details. Sometimes the first sign a user has that something is wrong is when they check their bank account! Can software actually speed up my computer? During normal computer usage you install and uninstall a variety of computer programs and applications may leave temporary files around or entries within the registry. Despite the large amount of “scareware” and fraudulent computer cleanup utilities out there, legitimate applications do exist that are designed to clean your system. This can be something we cover and is often done as a part of a complete computer tune up. The large speed boosts many of the fake utilities to unlock by simply moving files around are almost always false. Most computer can have a speed boost by more conventional means which include a combination of temporary file removal, registry cleanup, startup file optimization as well as hardware upgrades. Hardware components such as memory and a SSD upgrades can often be added to boost the speed of even an older PC and give it a new lease of life. Upgrading the computers RAM can double the working memory available to the system. With extra memory, many programs can keep more information available to work with. This upgrade reduces loading times and increases the computers ability to run more programs at once. Switching from an older style mechanical hard drive to a modern Solid State Disk (SSD) can significantly reduce startup and loading times of any PC as well as speeding up application loading times. Loading data from the hard drive is very often the slowest part of a computer, the bottleneck in an otherwise very fast system. Because an SSD does not use any mechanical components the time to access the disk is nearly instant when compared to older, mechanical hard disks. These upgrades offer boosts in speed to rival a modern system at only a fraction of the cost originally paid for the new computer. Performing some basic house keeping functions along with upgrading the RAM and swapping to an SSD will provide an instant, dramatic, and safe improvement to the speed of your PC. If your computer is running slow give us at a call on 08 8326 4364 or support@dpcomputing.com.au and arrange a real and professional cleanup of your computer systems.